Check out this video to experience the impact Pathways makes for its clients. With over 80% of all donations going directly to the clients, Pathways funds its program with donations from individuals, corporations, foundations, and service clubs. So many women’s lives are shattered before they can even begin. Butterfly Tears reveals the gripping and intimate stories of nine brave women who found the strength to turn their dark, raging worlds around. 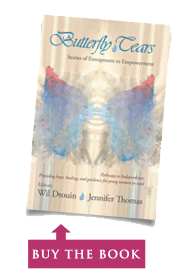 These compelling and inspiring transformations prove to anyone who has suffered life’s hardships—to the breaking point and beyond—that there is a way out. Especially for those with desire, drive, and the support of an unparalleled organization like the Pathways to Independence Foundation.